The above info came from Who Wants to Know?, and was edited by yours truly (contact me). The image came from Fox Kids. The age has come where robots are as commonplace as the household pet. Endowed with the intelligence and personalities encoded in Medals and equipped with a near-endless variety of Medaparts, these pet robots (or Medabots, as they are called) are the frequent companions of people around the world. Little Ikki had always wanted to have a Medabot of his own. His chance came when he stumbled upon a lost Rare Medal. Scrounging together what he could, he bought an old Medapart kit, put it together with the medal, and the result was Metabee. And since then, life has never been the same. And as if Ikki and Metabee had trouble between themselves, they also have to constantly deflect the attention of other Medafighters (like Samantha and the Screws), try to figure out the mystery of the Phantom Renegade, and defeat the efforts of the infamous Rubberobo gang, who seem to have an eye on Metabee for some reason. And all this because all he wanted to do was become a Medafighter. Can't a 10-year-old kid have fun these days? 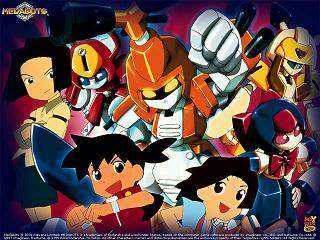 Medabots: where young kids pit their robotic pals against each just because they're bored! Okay, so not really, but it's not far from the truth. In the world of Metabots, which apparently takes place sometime in the future, it seems that not only does everyone own a robot slave, but they also all use them to "robattle". So it's basically a Pokemon ripoff, replacing the annoyingly cute critters with mechanical monstrosities. And while both series are most definitely made for children, speaking as an adult male, Metabots is a bit easier to watch. Anywho, the protagonist of this series is a kid named Ikki (pronounced like "Icky"). He's all bummed because everyone at school has a Medabot except for him, and his mom refuses to buy him one, saying that he needs to save his money and buy one himself (boy if that doesn't bring back memories!)... so he does what any kid would do in that situation and hangs out at the store staring at the Medabots. One day the store owner takes pity on Ikki and offers to sell him an old model for the little money that Ikki has... and Ikki refuses! Seems kinda lame to me after the big fuss he made. To be fair, the store owner was only offering to sell him a Medabot body, not a Medabot medal (which is like the equivalent of a brain or soul). After some mostly insignificant events, Ikki finds a Medabot medal, buys the Medabot body, and starts his wave of robot-on-robot violence! Of course, it soon becomes clear that there's something special about that mysterious Medabot metal, as Metabee (that's Ikki's Medabot) has much more personality than your average run-of-the-mill Medabot. If fact, he actually refuses to follows Ikki's commands at first. This changes as they realize how much they need each other. There isn't a real flowing plot line here, as most episodes can be taken as they are, in whatever order. Each finds Ikki and pals going on some kind of minor adventure. In several of the episodes they wander far from school and stay out late and I can't help but wonder what is up with these kids' parents? For instance, in one episode the kids are out at night in a forest, and in another they follow their coach downtown. Is this sending the right message to kids? Well, at least they're using the buddy system! The show does have some scenes which actually made me chuckle, such as seemingly every time there is a robattle about to happen, the referee pops out from some hidden area, which reminded me of Agent 13 from Get Smart . There is some dialog between Ikki and Metabee which is occasionally more interesting than I would expect from such a show, but overall the characters and stories are all rather plain. Not a bad show for kids but adults will find it lacking. The first season DVD box set released by Shout! Factory is called , though technically it's not quite complete as they're missing Japanese episode 19 "Once Frostbitten Twice Shy" (ピンゲン南へ…), episode 20 "Heavy Medal" (レアメダルを奪え! ), and episode 23 "Bridge Over Troubled Squidguts" (風と火の記憶). Apparently they must have realized this at some point, because attached to the front of the DVD box is a sticker that says "The Complete First Season As Seen on Fox Kids". Also, there is no Japanese language track, unfortunately. This is understandable, though, since this is the series as it was released on Fox Kids, and thus it went through a few edits, so the Japanese track wouldn't always match up. I would much prefer an unedited version that did contain the Japanese language track, but that's not what this is. I did find it odd, however, that there was no subtitle track. There's really no reason not to put one in, except for that they didn't think it was worth the effort.